My middle son loves to bake and he just LOVES eggnog so he asked if he could make some eggnog cupcakes with our favorite cinnamon frosting last Christmas eve. I certainly wasn't going to stop him, even if I don't like eggnog. He took our favorite vanilla cupcake recipe and substituted eggnog for the milk.... and I have to admit that they were really delicious!! Once we assembled all our ingredients we used our stand mixer to beat together the butter and the granulated sugar. Once combined we added in the eggs and vanilla extract. In a separate bowl we combined the baking powder, salt, and flour. We added the flour mixture into the butter mixture slowly, alternating with the eggnog until everything was blended together smoothly. We then scooped our batter into our prepared muffin tins and baked them at 350 for 18 minutes. Until the cupcakes spring back when you press on them. We cleaned out our bowl thoroughly and then mixed up our frosting using our stand mixer. Beat butter on high for one minute and add in confectioner's sugar, cream and vanilla. Beat on low for 30 seconds or so until all the confectioner's sugar is mixed in and then beat on high speed for three minutes. If frosting is thin you can add up to another cup of confectioner's sugar and if frosting it thick you can add a bit more cream. Once we had a consistency we liked we added 1 Tablespoon of ground cinnamon and then tasted our frosting to make sure it was the perfect balance of cinnamon and sweetness. Can you see the flecks of cinnamon in the frosting? The cinnamon flavor was the perfect compliment to the eggnog cupcakes. These cupcakes were so flaky and moist and could really taste the eggnog flavor. They were just perfect for enjoying at Christmas. Mmm! Okay, so these look AMAZING, and I love how pretty the frosting is on top. I have never, ever had eggnog, which just seems wrong, doesn't it?! Do you like it? Do these muffins taste super similar to it? I am so weirded out by it too; it tastes awful and the thought of drinking eggs-- ugh! But I knew I could handle it cooked in a cake or cookie because it wouldn't be thick and gross and the eggs would no longer be raw. Mmmmmmm my family loves all things eggnog. Going to have to try this recipe. Thanks for sharing! Hope you all enjoy them! Oh that sounds so good.. and you got a great helper there! I really do have an amazing helper in the kitchen. Your cupcakes will be so special and delicious! 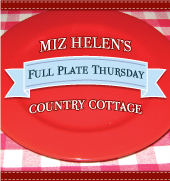 Hope you are enjoying your week and thanks so much for sharing with us at Full Plate Thursday! Your cupcakes look so good! I'm going to use them as one of my features for the Happy Holiday link party! Thanks so much for the pin. This is yummy! My son will love it.